Another great challenge over at Moxie Fab. For this challenge you need to create a paper crafted project that incorporates some kind of household item as its focal point. 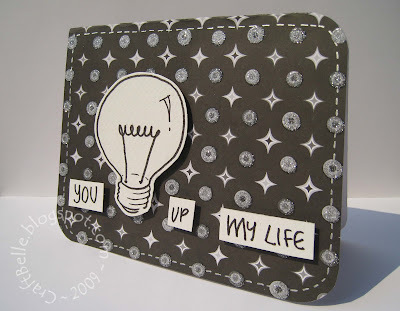 Cath has included lots of inspiration so check out the link above. Okay, getting hold of a "household" stamp has been pretty impossible around here. So, I decided to opt for the old pen and paper and make my own doodle instead. 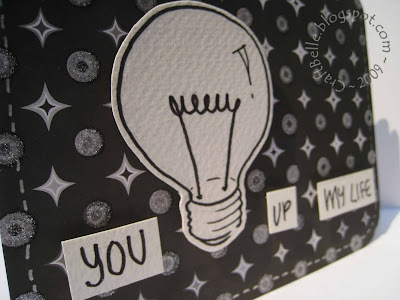 The light bulb and sentiment was drawn onto watercolour - I really love the bumpy texture. Then I popped them up with foam stickies and added some faux stitching to the DCWV paper. Voila! Winter stole my first thought- very "bright" card! Adorable! !